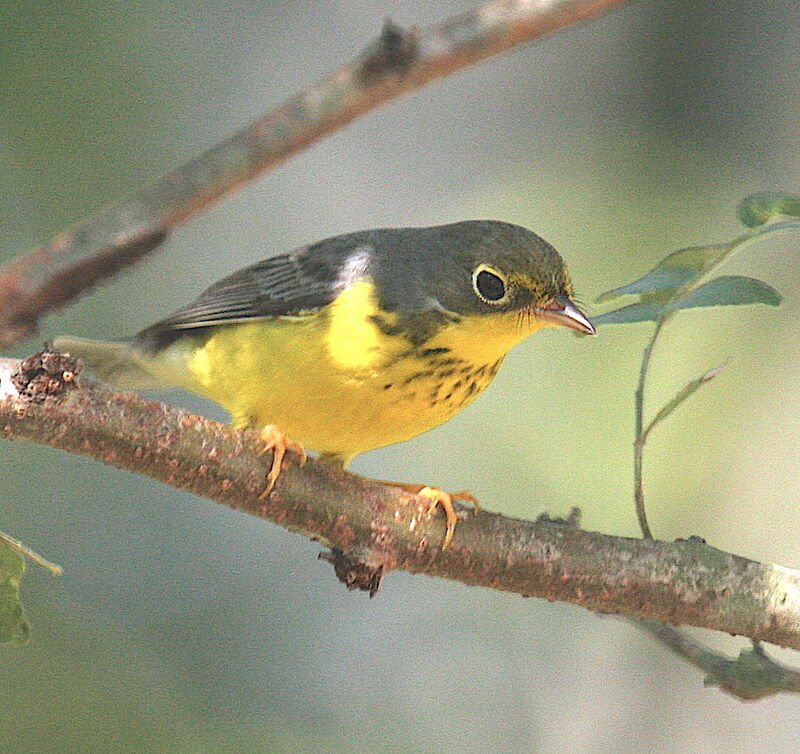 As reliable as seasonal clockwork, the migratory warblers are swarming south from their summer breeding grounds to warmer climes for the winter. 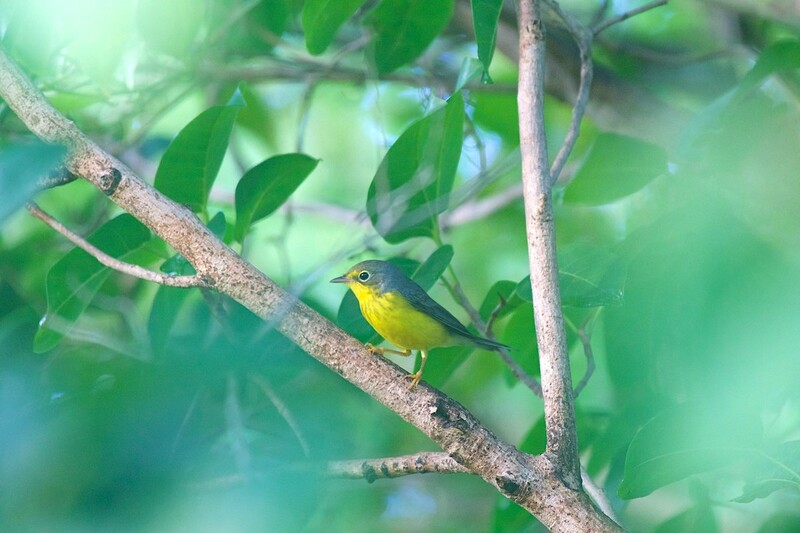 In the case of Abaco, this amounts to 32 warbler species to add to the 5 resident breeding species (Bahama Yellowthroat, Yellow Warbler, Olive-capped Warbler, Pine Warbler & Bahama Warbler. 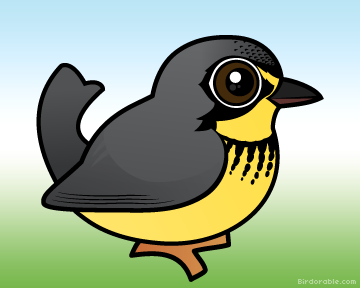 37 warblers in total. Well, now make that 38. 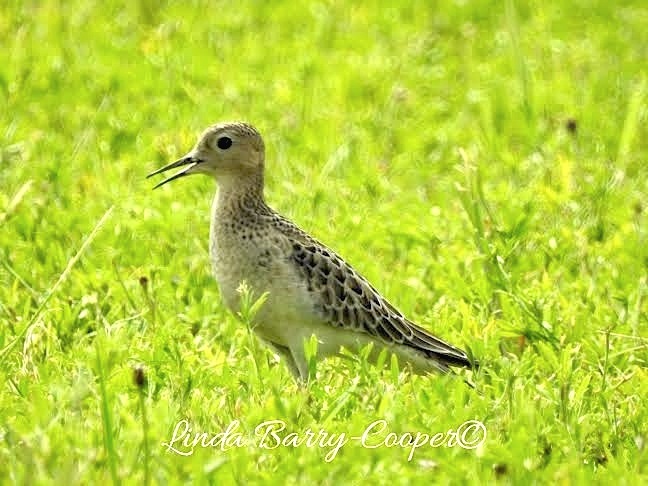 On August 28th, young birder Christopher Johnson was out with well-known birding sage Woody Bracey when he saw something small and yellow hopping about in the coppice. 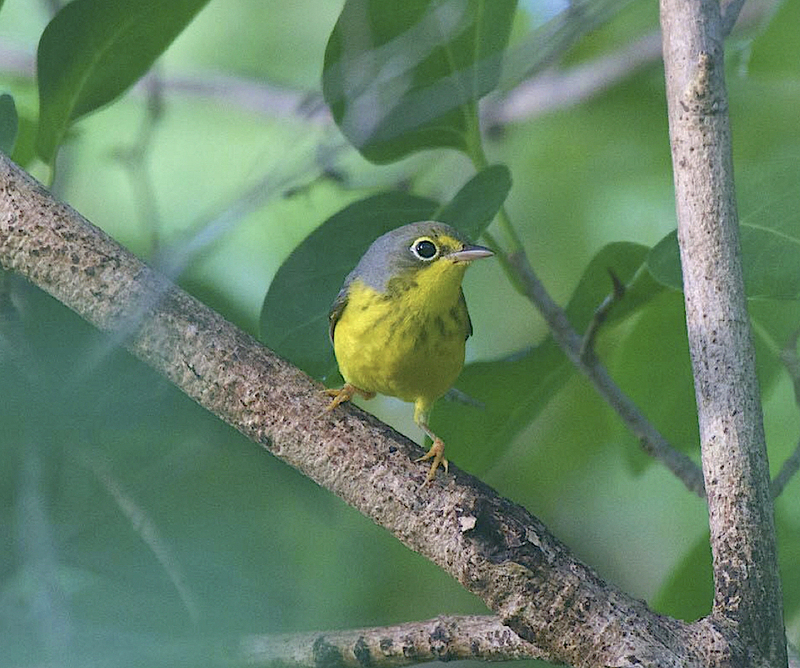 On closer examination – and he took the photos to prove it – it was not just one of the many familiar yellowy winter warblers, but a completely new species recorded for Abaco and (more significantly) the entire Bahamas. 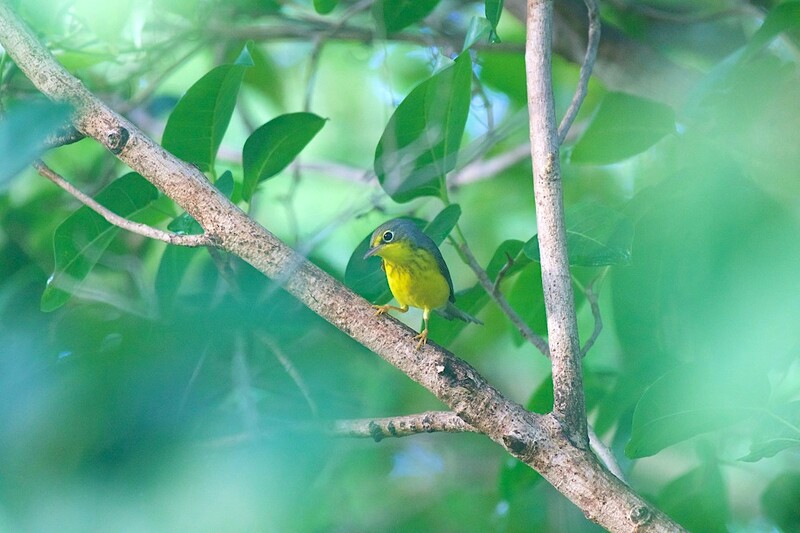 It was a Canada Warbler, Cardellina canadensis (Linn. 1766) aka Wilsonia canadensis. The photo above is one of 3 that Christopher managed to take. In many respects it is typical of a field photograph: a small bird, at a distance, zero’d into focus through a small gap in the leaves and branches of thick coppice. 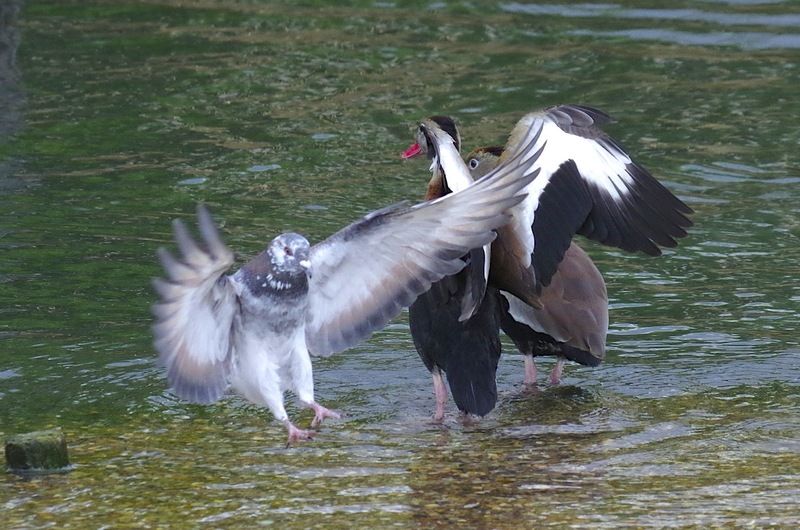 Sharp bird, blurry surroundings. The trick is not to end up with a wonderful clear shot of a green leaf on its twig, with a small yellow blur in the background. (I perfected this ill-advised technique with my only photo of a Kirtland’s warbler). 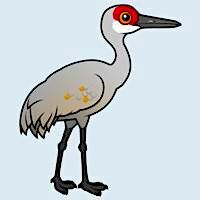 WHERE WAS THIS BIRD DISCOVERED? One of the features of the excellent birding to be found on Abaco is that some of it can be carried out in unexpected places. Town dumps are a classic example, though photos have to be taken with care to avoid unsightly rubbish-based settings. 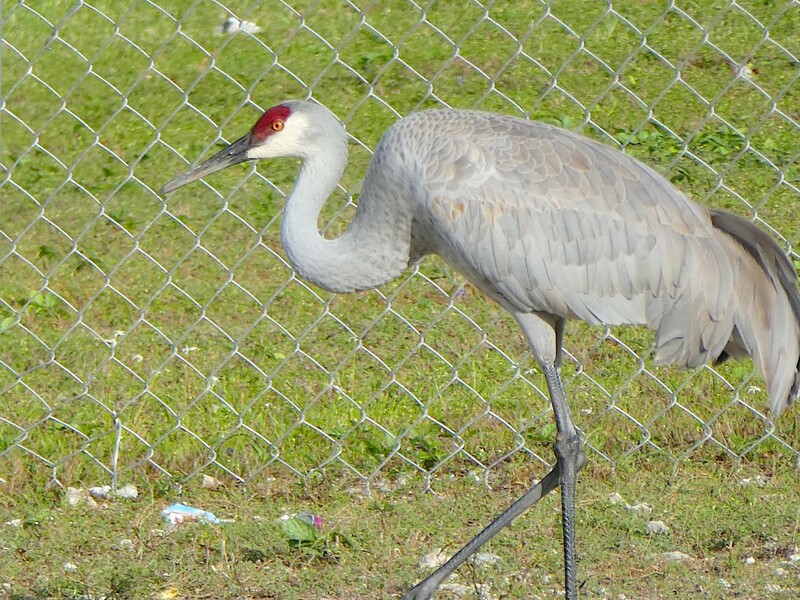 The Abaco Big Bird Poultry Farm area is another. This little bird was found there. SO WHERE WOULD IT NORMALLY BE FOUND? 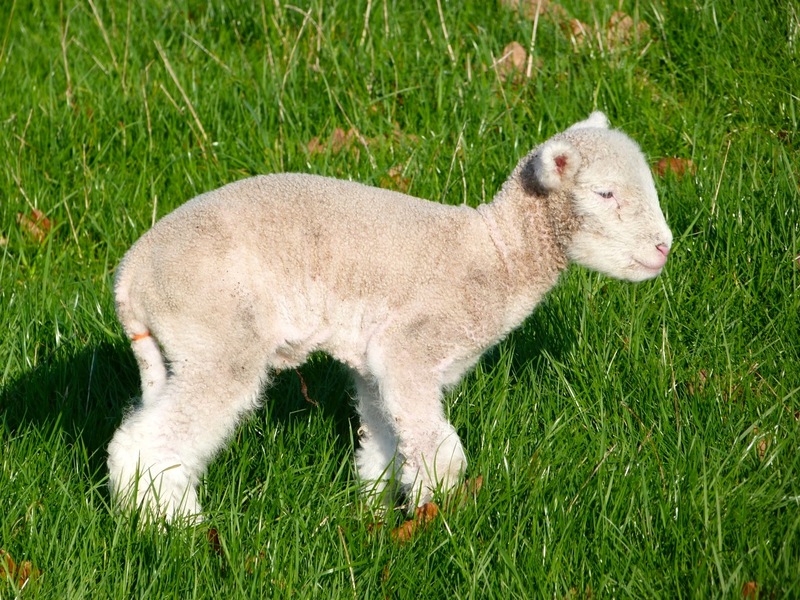 In summer, roughly 80% of CAWAs live and breed in Canada; 20% in the northern US. They spend a relatively short summer there. 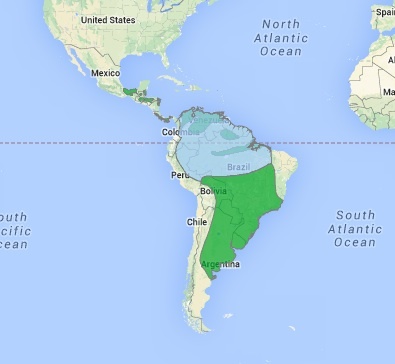 In the early Fall they fly down to South America. From the range map below, it looks as though their flight path would naturally take them right over the Bahamas to get to their destination. In fact, their journey is quite different. 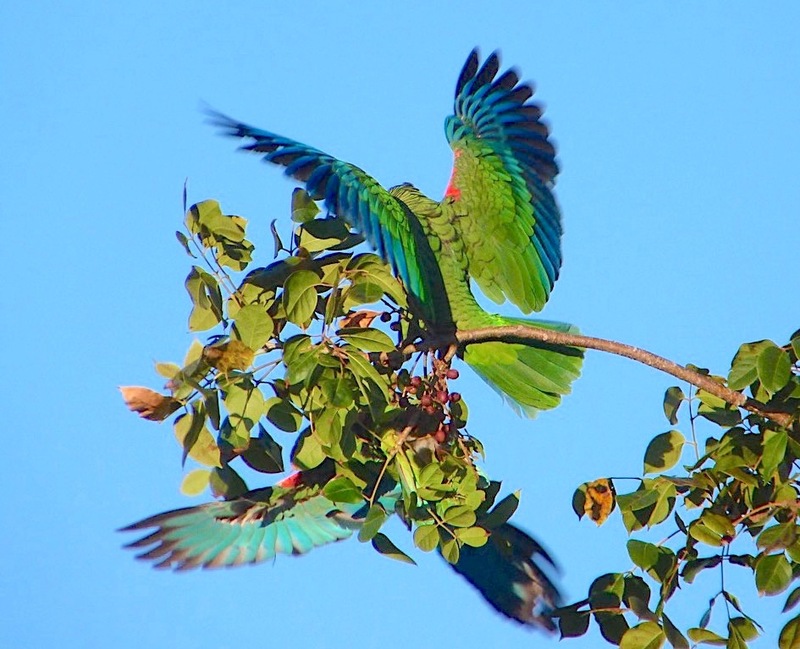 Following the central ‘bend’ of the Americas, they fly at night along a southwesterly route to the Texas coast, then on to southern Mexico and beyond. I suspect that, as with many migratory birds, the occasional specimen takes a wrong turn on its route south, or is blown off-course by a storm. Maybe a few such vagrants pass through further east – even over the Bahamas perhaps – each year, as ‘vagrants’. But in reality their tiny size in the dense foliage of the land masses means that only a fluke sighting could result. So Christopher’s sighting will be recorded as a V5 – a vanishingly rare vagrant with only a single sighting (cf Abaco’s BLACK-BROWED ALBATROSS). WHAT DO I LISTEN FOR (JUST IN CASE…)? The two sounds to listen for are the chirpy scrap of song and the ‘chip’ call. WHAT IS THE CAWA’S CONSERVATION STATUS? Oh, and all those damn deer browsing the understory a bit. Blame them! 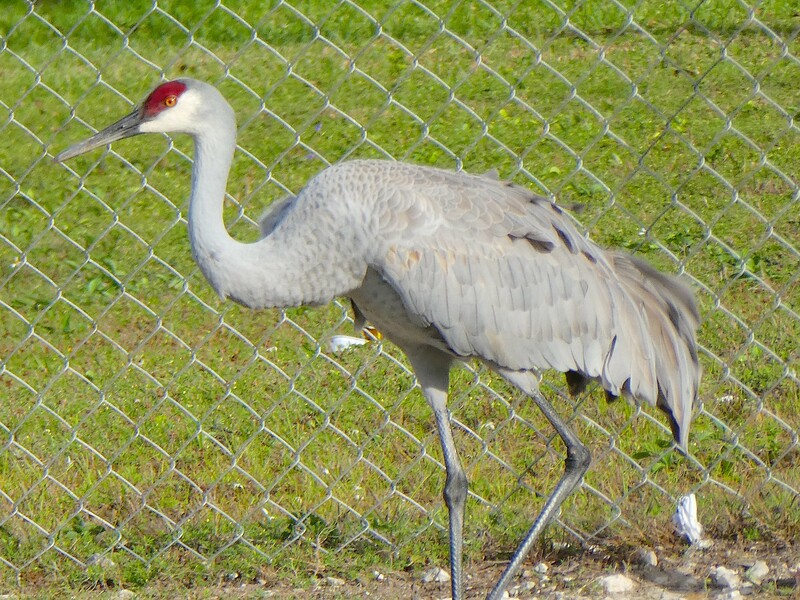 ARE THERE ANY FUN FACTS ABOUT THIS BIRD? Well, confusion about its name, maybe, though that’s more ‘interesting’ than ‘fun’, I think. 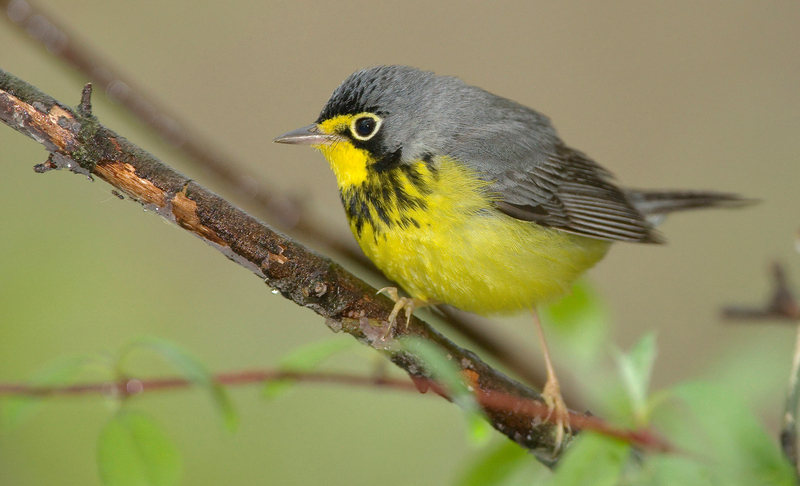 In 1760, a French zoologist named Brisson gave a name to a warbler specimen from Canada. 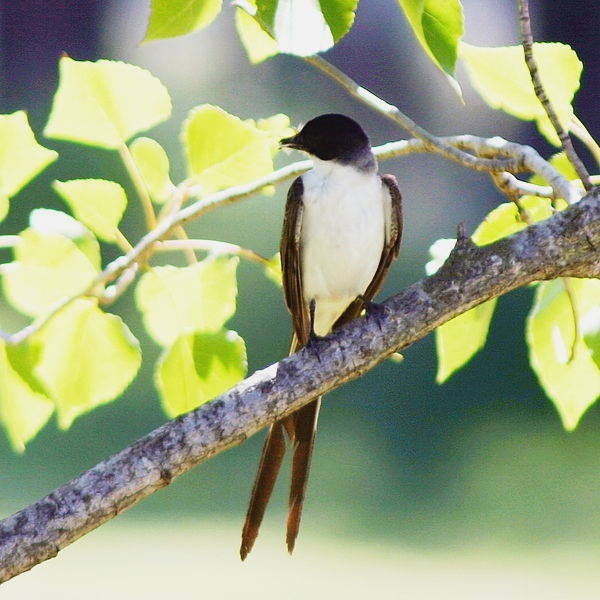 It was “Le gobe-mouche cendré de Canada”, ie ‘The Canadian Ash-gray Flycatcher’. 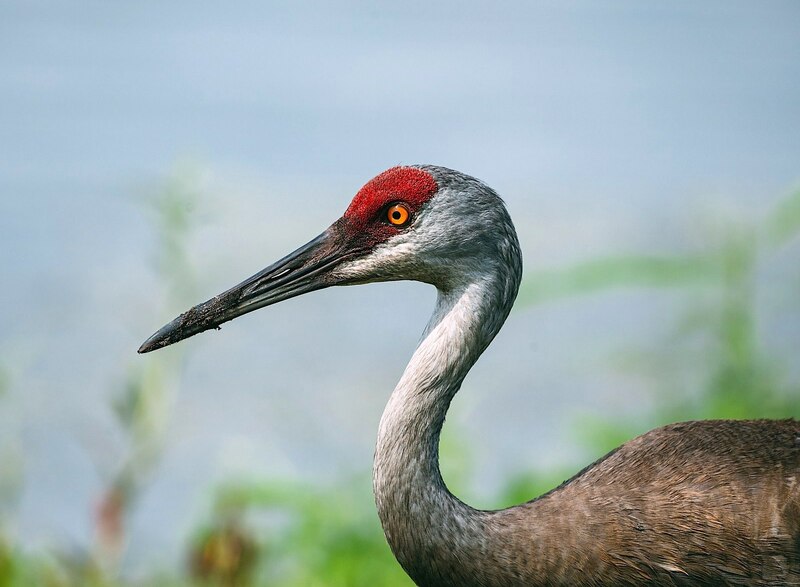 Because he needed a conventional Latin name for the bird, he put together the name Muscicapa Canadensis Cinerea. This did not fit in with the binomial system of taxonomy (nor was it a very good description of the bird), and the name was accordingly rejected by the wonderfully named International Commission on Zoological Nomenclature. Linnaeus (to cut a longer story short) sorted it all out in his next edition of Systema Naturae in 1766, with the binomial name Muscicapa canadensis. In due course the genus Muscicapa was changed to Cardellina. THAT WASN’T A WHOLE LOT OF FUN. IS THERE MORE? 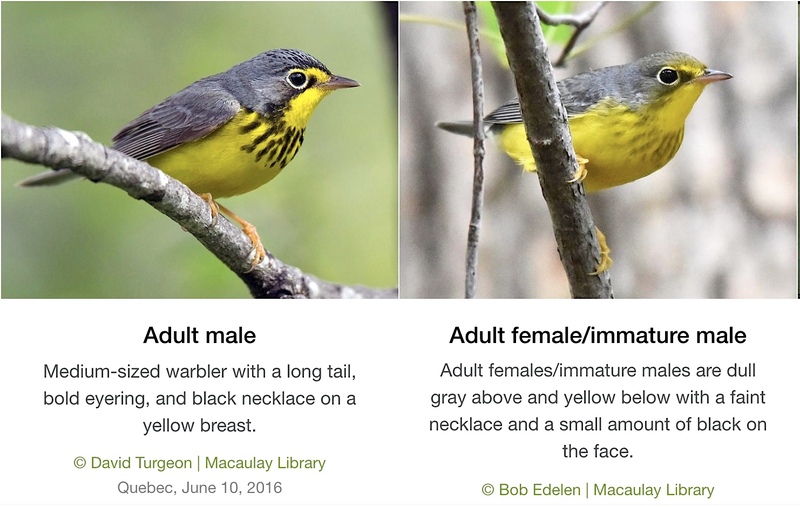 Well, there were more naming shenanigans when John James Audubon illustrated a female Canada warbler in Birds of America nearly a century later. 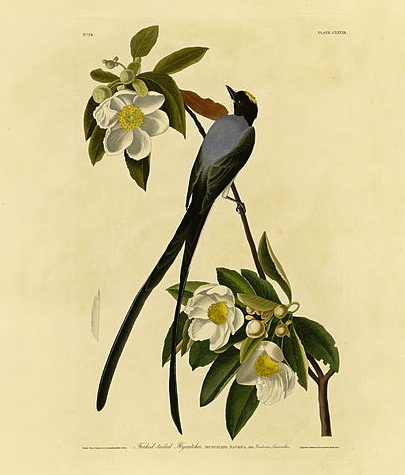 Plate 73 (below) was entitled “Bonaparte’s Flycatching-Warbler—Muscicapa bonapartii.” He’d slipped in the name of ornithologist (and nephew of the more famous Emperor) CHARLES BONAPARTE, he of the BONAPARTE’S GULL. This version did not stick. However the CAWA acquired another ‘tribute’ name, an alternative that is still in use: Wilsonia canadensis. 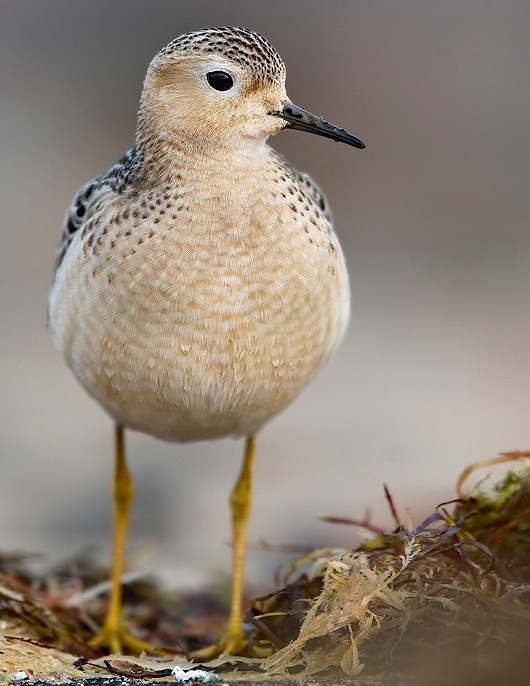 This tip of the hat is to another ornithologist ALEXANDER WILSON, of Wilson’s Plover fame. 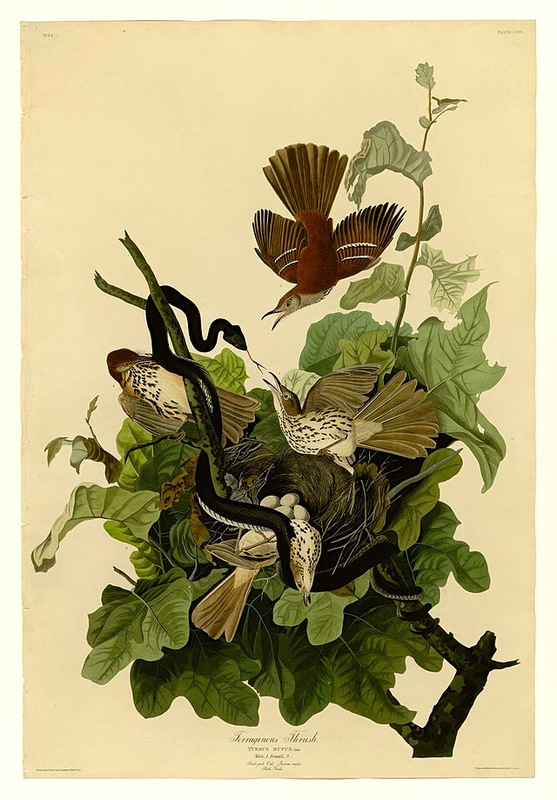 Photo Credits: Christopher Johnson (1, 2, 3); Emmet Hume / Wiki (4); Male / Female CAWAs, David Turgeon & Bob Edelen, Macaulay Library; Audubon Plate 73, OS; William H Majoros / Wiki. 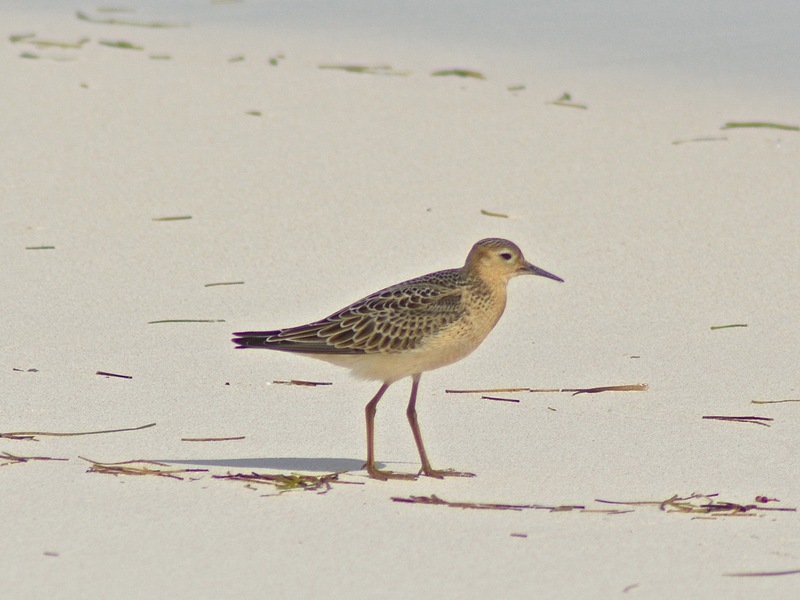 Sound Files, Ian Davies & Andrew Spencer / Xeno-Canto; Abaco Resident Warbler Chart, Keith Salvesen;, Cartoon by Birdorable; Range Map, Cornell U.
I’d best make it clear at the outset that, in the very narrowest sense, the buff-breasted sandpiper (Calidris subruficollis) is not strictly a new bird on Abaco. Tony White’s authoritative official checklist for Abaco, valid back to 1950 or so, does actually include the species. 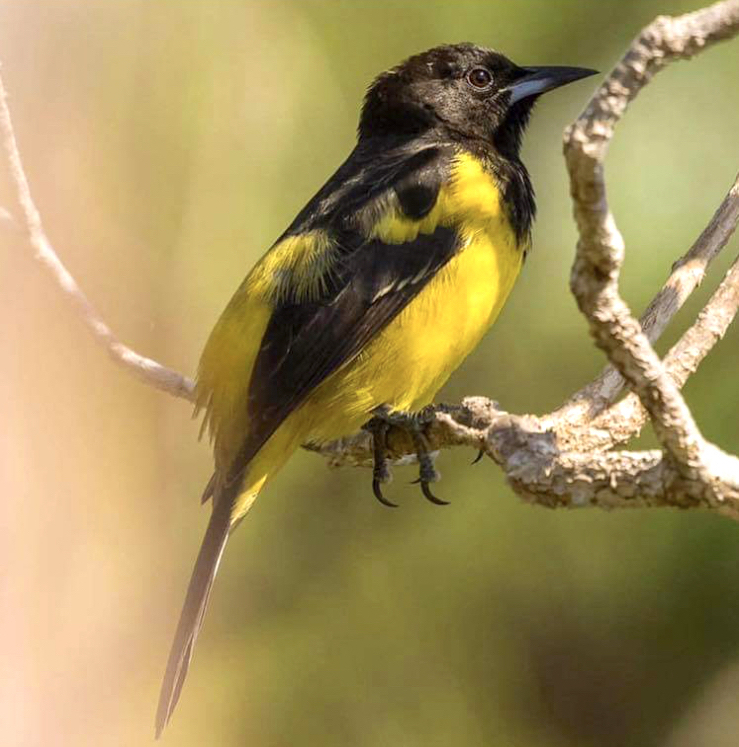 It is classified as a ‘V5’, which is to say a vagrant that is vanishingly rare – indeed may only have been sighted on Abaco once or perhaps twice before. Ever. 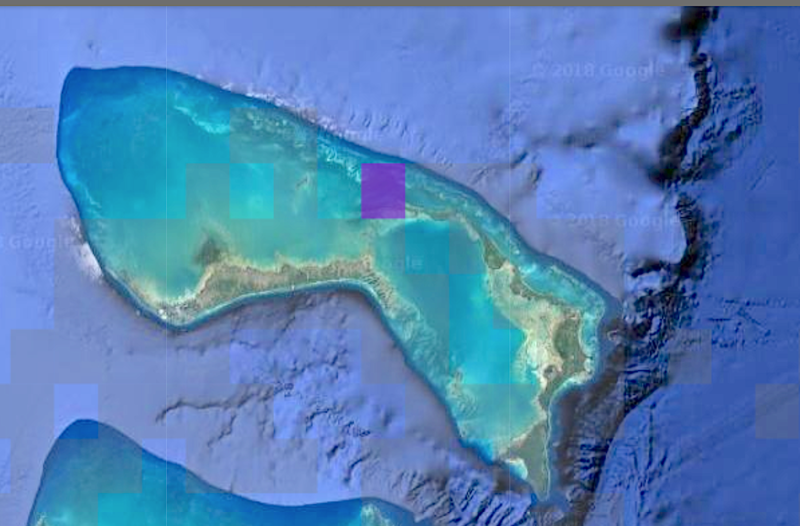 The only category rarer than V5 is H for hypothetical, which essentially means that there is some unconfirmed report of a bird that it might not be outrageous to suppose might be blown onto Abaco. 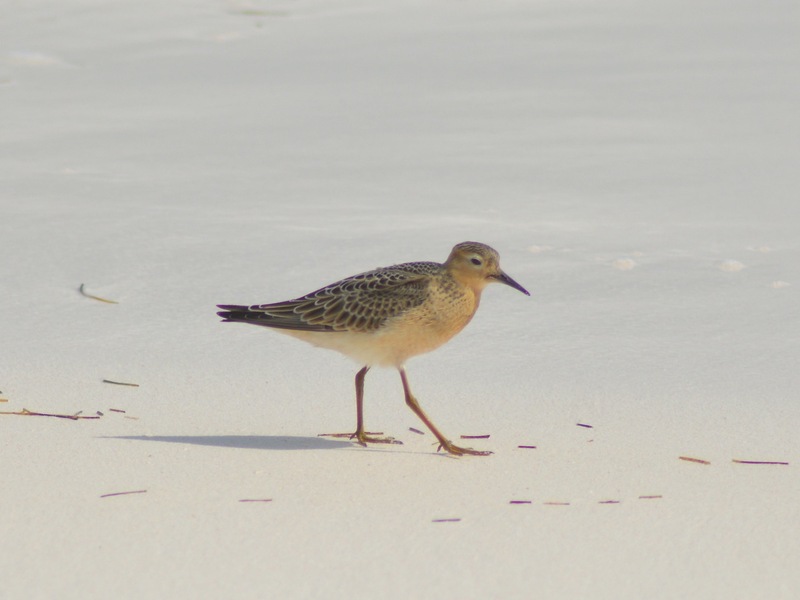 A penguin, therefore, would not qualify even for an H.
A few days ago, beyond a shadow of a doubt this small shorebird was seen on Abaco by Keith Kemp, and photographed by him too. He is having an excellent year with his birding: this may well be the jewel in the crown for him. So even if one of these little guys was once spotted on an Abaco twig in 1961, Keith is definitely the first person to get a photo! UPDATE (next day!) 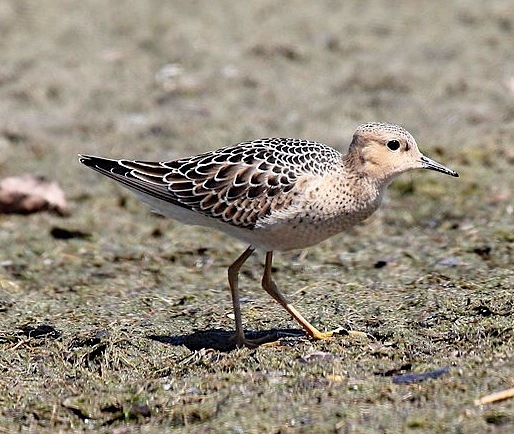 Abaco birder-in-Chief Woody Bracey has solved the mystery of the previous sighting – it was he himself who saw a BBSP “years ago” at the less-than-glamorous yet excellent-for-birding Marsh Harbour ‘Dump’. 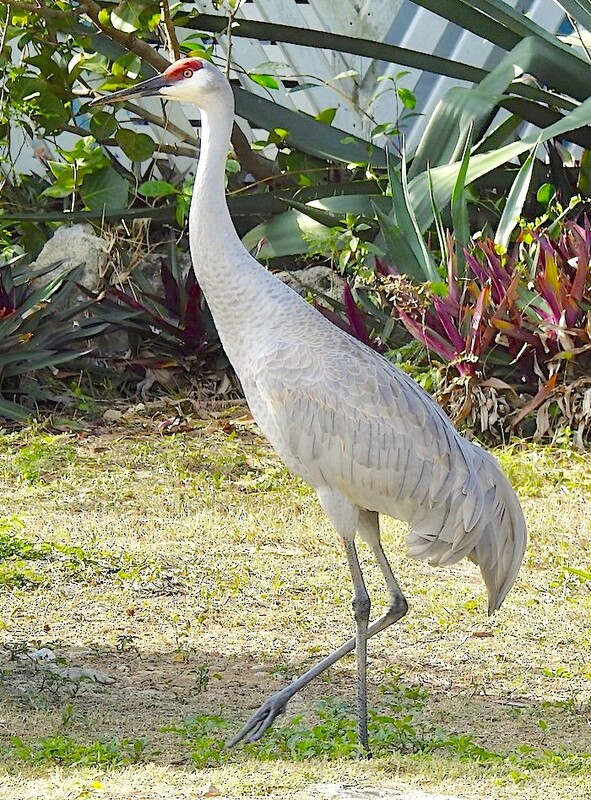 As it happens, some weeks ago a BBSP was also spotted at West End, Grand Bahama by Linda Barry-Cooper. 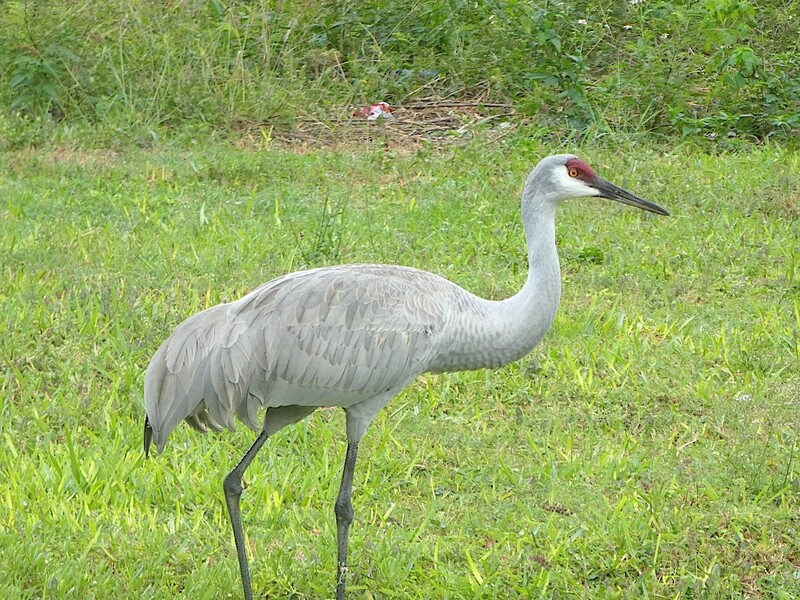 I featured a guest post from her about the fall birds in that region HERE. Woody Bracey also says that he and Bruce Hallett saw 2 BBSPs at West End early this season. 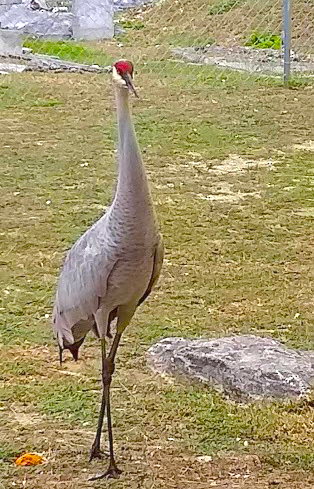 Erika Gates and Martha Cartwright saw one on the GB Reef golf course at the end of August. 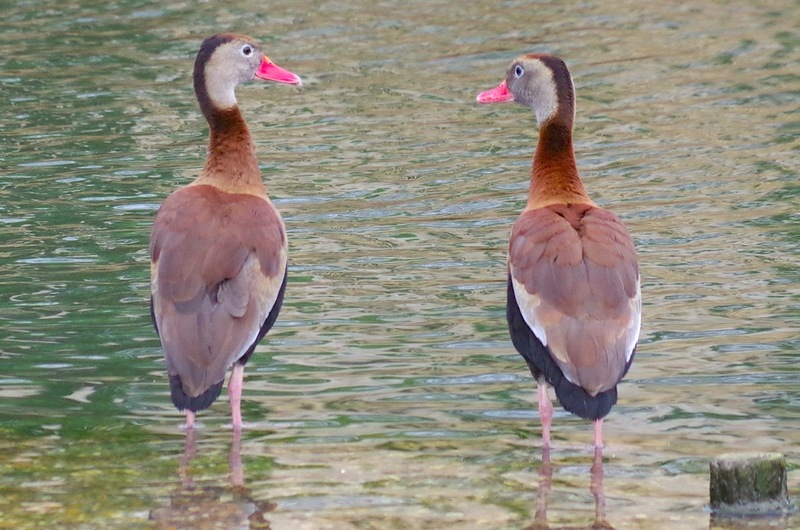 So these birds are around in the northern Bahamas, and perhaps it’s not such a surprise after all that one should have gone on a little expedition to Abaco to check out the undeniable joys of Winding Bay. 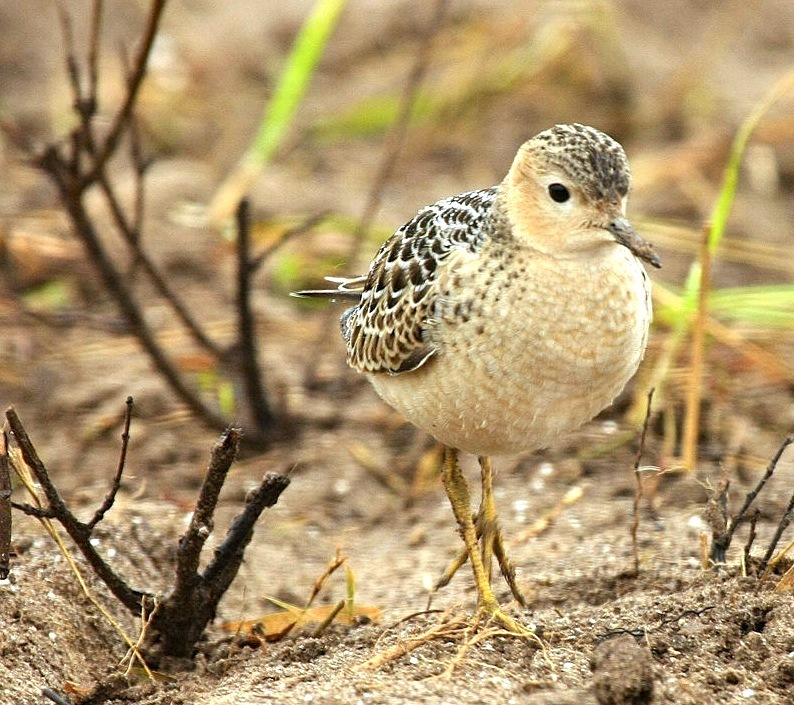 The buff-breasted sandpiper is a long-distance migrant, breeding mainly in the open arctic tundra of North America, and overwintering mostly in South America, especially Argentina. 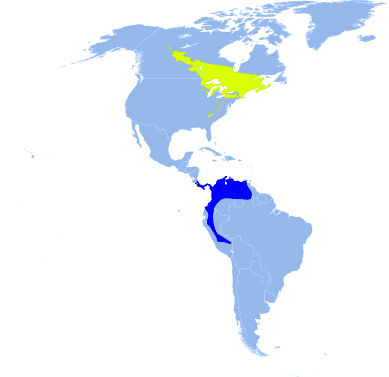 Its route takes it overland – the central flyway – rather than over coasts, but as it happens, as a species it is a bit of a wanderer. 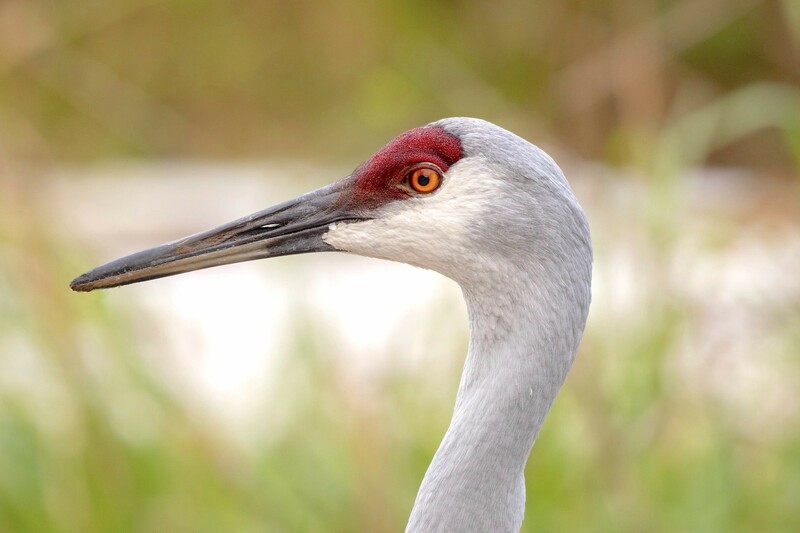 These birds a regularly found in Europe – including the UK – and although I am sure a sighting there must generate a great deal of excitement, they are not considered extremely rare. They have even been found, very occasionally, in South Asia and Australasia. In the breeding season, males collect on display grounds, or “leks,” to attract females. This helpful description comes from Audubon: “The leks are spread out, each male defending an area of up to several acres. The male displays by raising one wing, showing off the white underside. 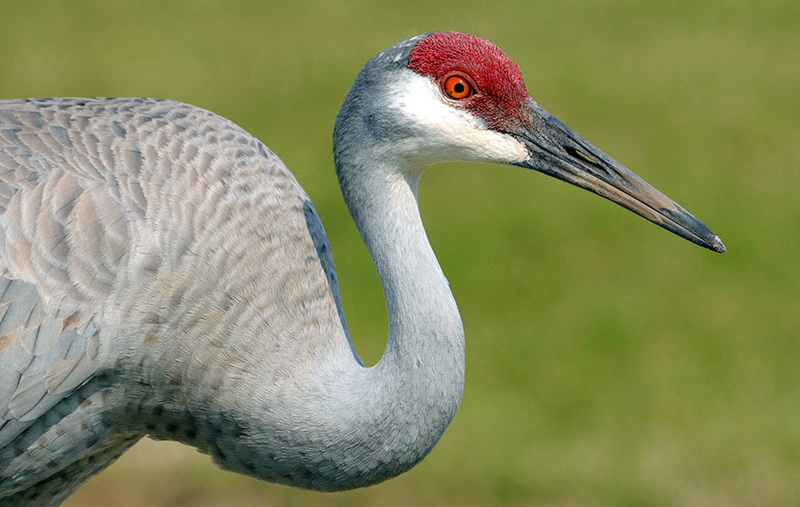 If females approach, the male spreads both wings wide, points its bill up, and shakes its body. 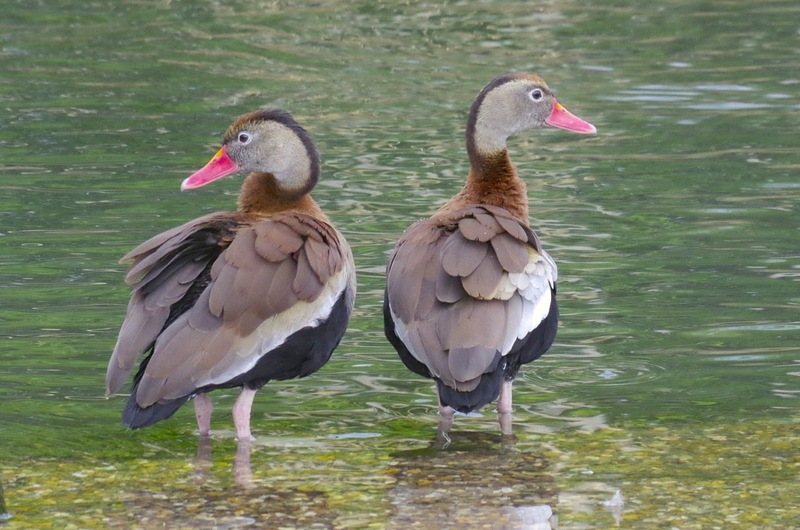 One male may mate with several females; the male takes no part in caring for the eggs or young.” Typical, huh? 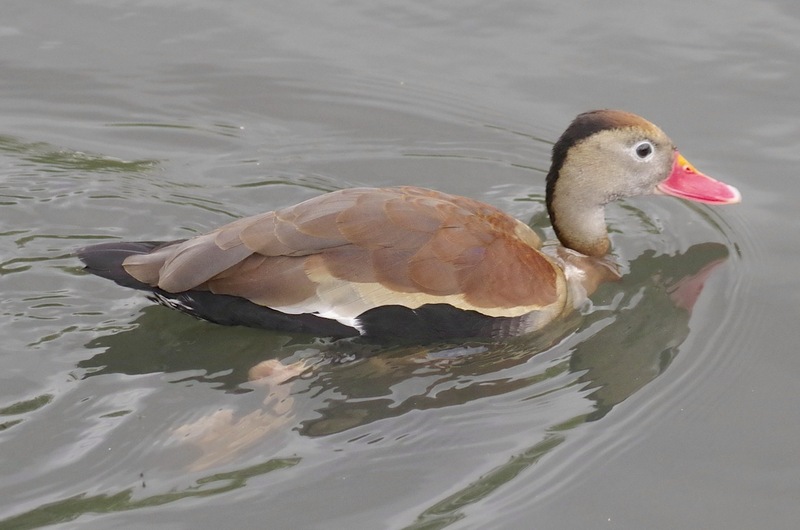 The BBSP is another bird that has been hit badly by the passage of time. By which I mean, of course, by mankind. At one time they were deemed ‘abundant’. 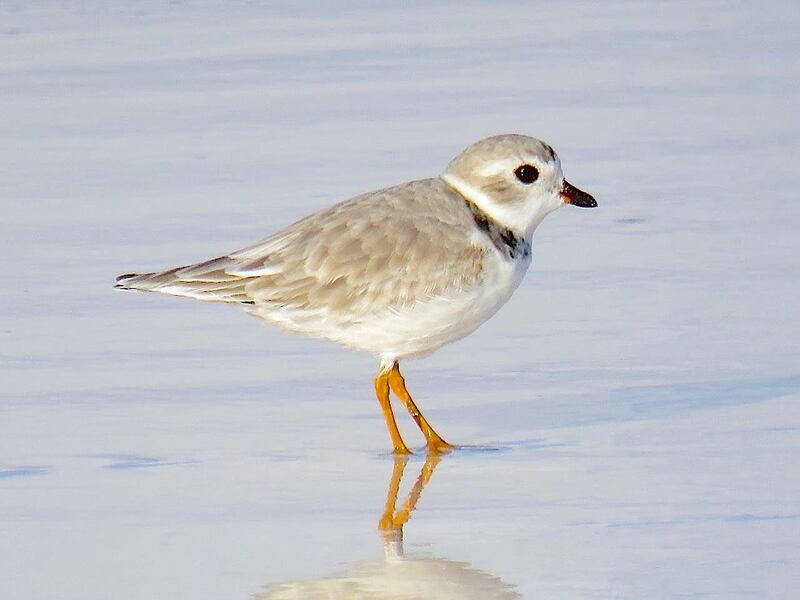 Around 100 years ago a serious decline set in, not least because people were shooting them during their migration. Nonetheless, in 1988 the IUCN assessment was ‘lower Risk/least concern’. Then another slide began. By 2000 it was ‘lower Risk/near threatened’. Since 2004 it has been ‘near threatened’. Why? 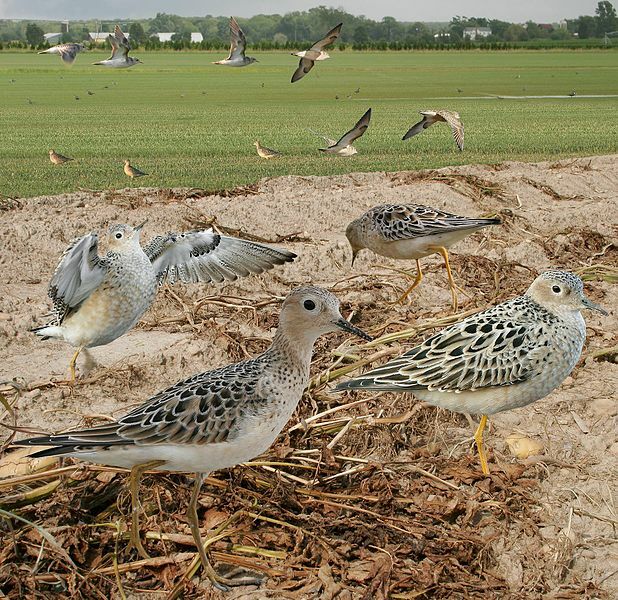 Largely because the habitat for migrating and wintering birds has been destroyed or degraded. Credits: Tim Lenz, Keith Kemp, Magnus Manski, Linda Barry-Cooper, Cornell Lab (range map), Mario Porras, Crossley Guides, Bernabe Lopez-Lanus @ Xeno-Canto, Audubon, Wiki. 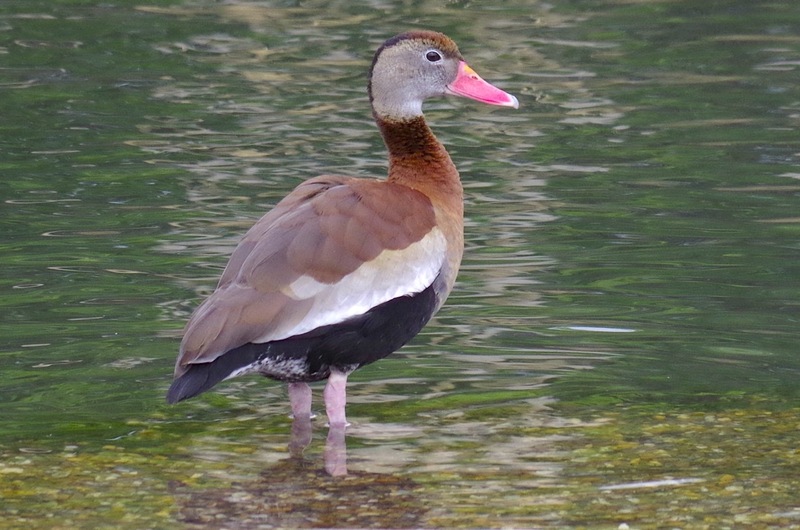 The first ever Black-bellied Whistling Ducks recorded for Abaco arrived last June. 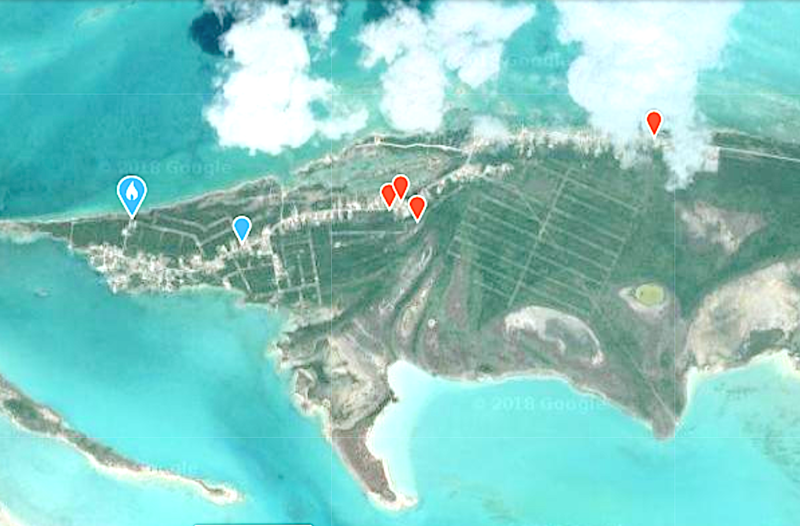 Six birds turned up on South Abaco in the Crossing Rocks area and slowly worked their way north via Delphi, Bahama Palm Shores and Casuarina. They split up into smaller groups. Two were seen near the airport. Eventually, after 3 weeks or so, the sightings and reports ceased. The BBWDs had moved on, presumably to Florida. Hello! 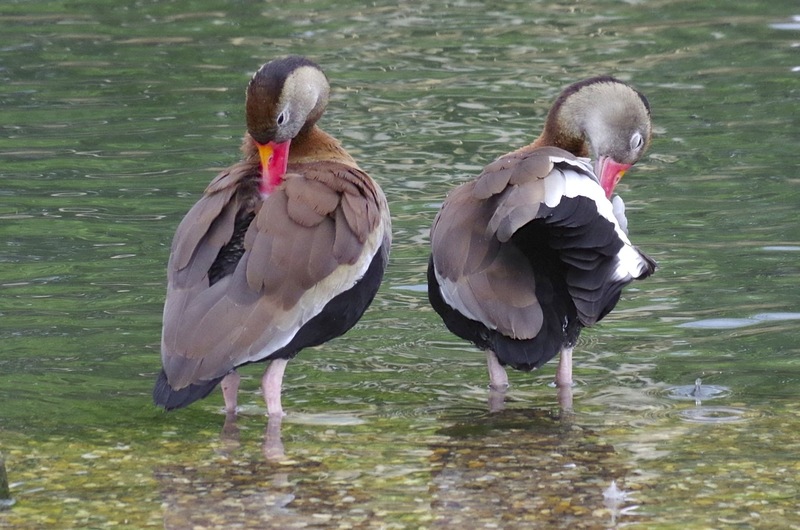 Would you like to preen with me? Yes I would. As long as there are no paparazzi around. Mmmmmm. This is so great! 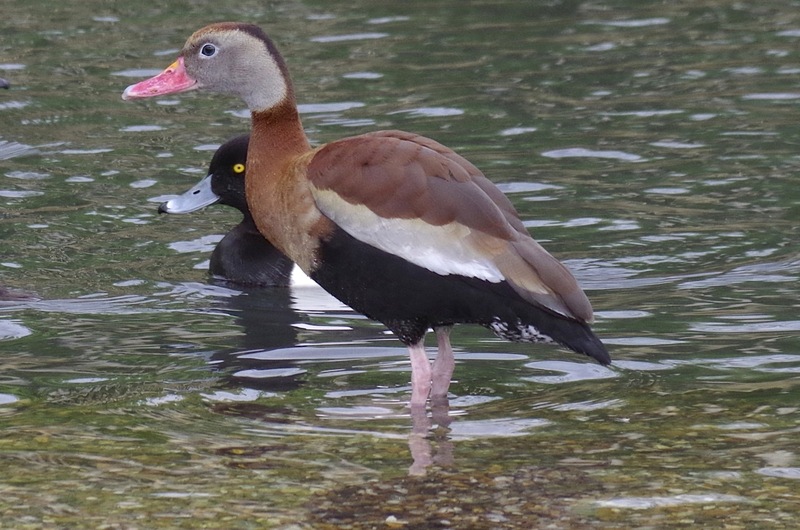 The third new bird species this year has been found on Abaco by bird authority Woody Bracey. 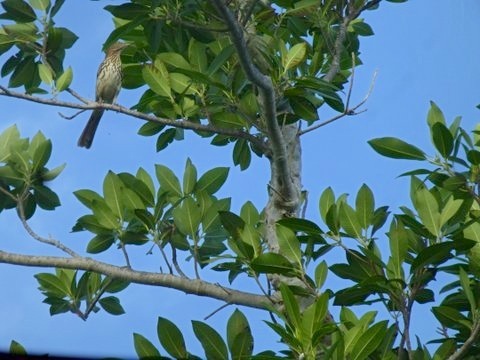 After the excitement of 6 BLACK-BELLIED WHISTLING DUCKS in June and a FORK-TAILED FLYCATCHER in October comes the very recent sighting (with photos) of a BROWN THRASHER, hitherto unrecorded for Abaco. 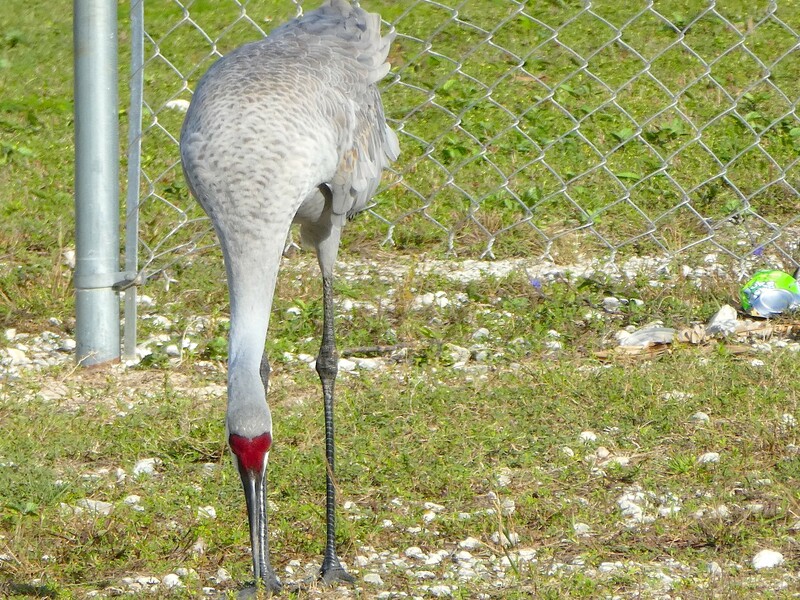 It was seen near Treasure Cay, at the site of a derelict restaurant. 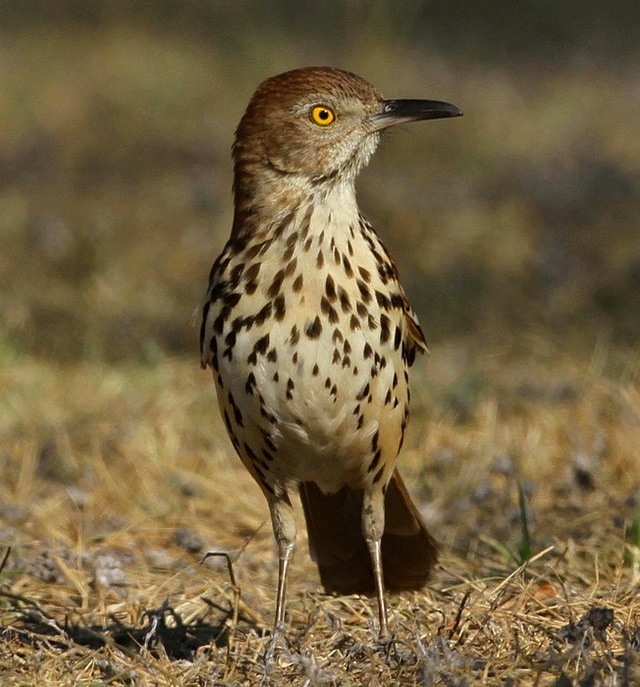 The Brown Thrasher (Toxostoma rufum) belongs to the same family that includes mockingbirds and the catbird – Mimidae. 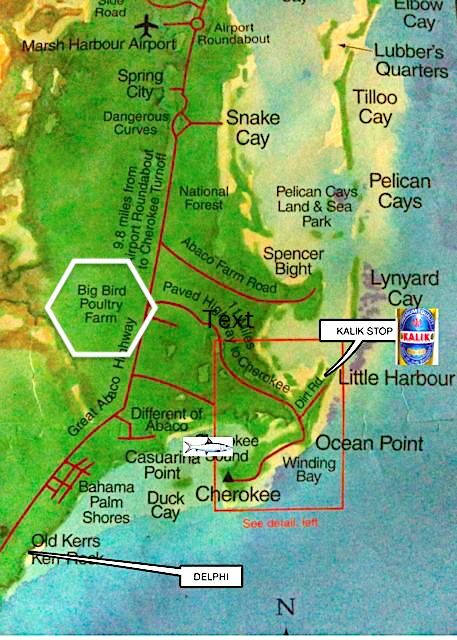 Its normal range includes Florida where it is resident, so there’s only 200 miles of ocean to cross to reach Abaco. Easier still with a stop-over on Grand Bahama. 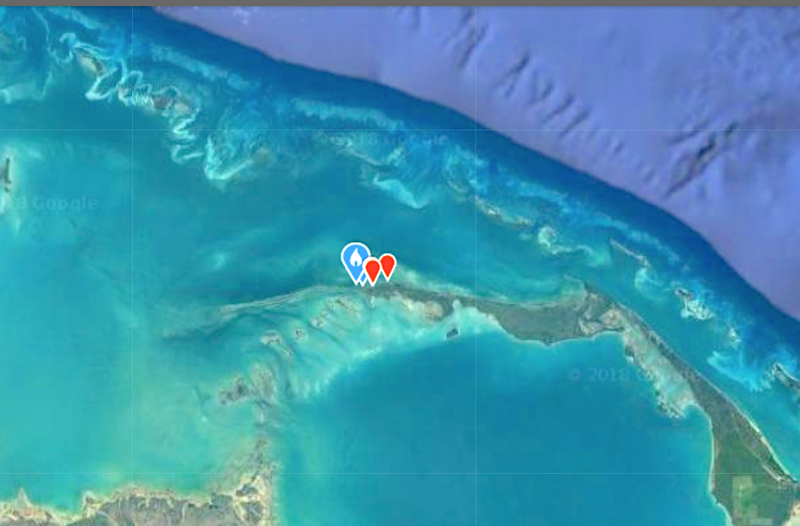 However I’ve checked for other Bahamas sightings, and so far I have found one recorded for Grand Bahama, and one for Eleuthera. So this first sighting on Abaco is possibly only the third for the Bahamas, suggesting that the Thrasher is generally not a great adventurer. And here are Woody’s evidential images of his sighting. They may not be such close shots as the others but they are conclusive for the record. 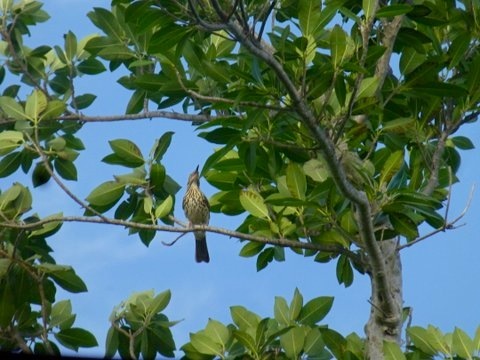 BESIDES ONE BIRD VISITING ABACO, WHAT’S INTERESTING ABOUT THE THRASHER? YES INDEED, BUT IS THERE ONE REALLY MEMORABLE FACT ABOUT THEM? 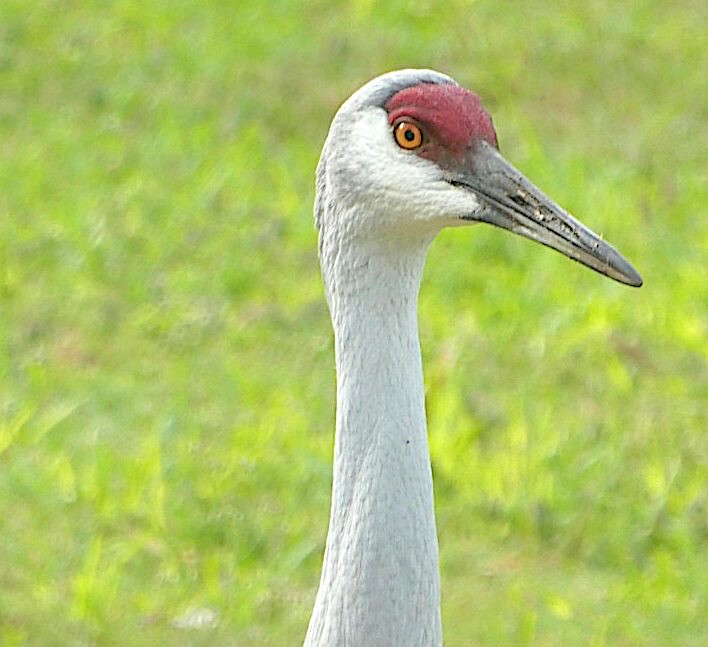 OK. Their necks are extremely flexible and they have more vertebrae than camels or (get this!) giraffes. 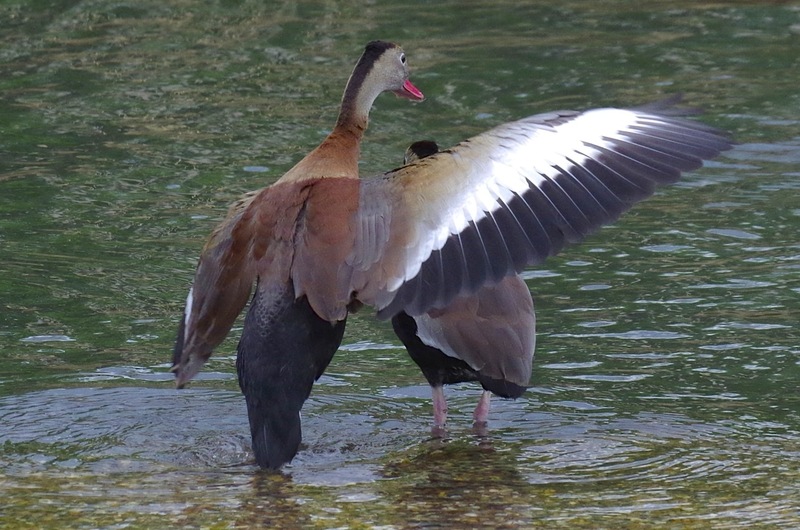 Following the flurry of reports and photos in June of Black-bellied Whistling Ducks on Abaco – a species never recorded here before – comes a new ‘first bird’: the Fork-Tailed Flycatcher Tyrannus savant. 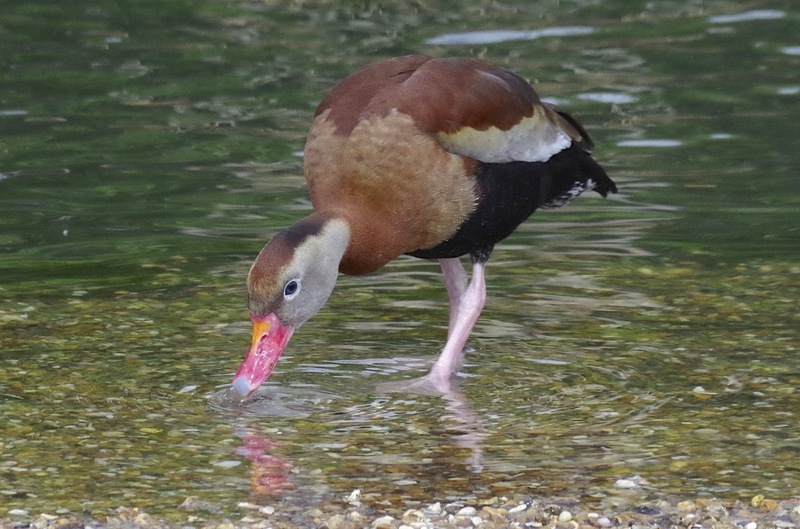 On September 24 Shirley Cartwright saw an unusual bird with a long dark tail and managed to get a photo of it of sufficient quality for a certain identification to be made. 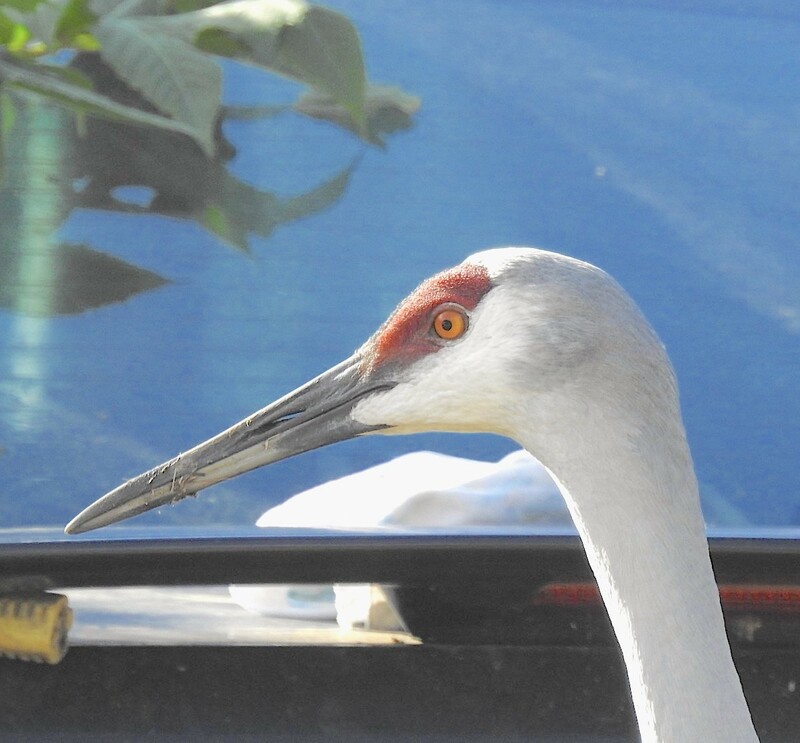 Never mind the photo detail, the fact that Shirley saw the bird and was able to obtain photographic confirmation is the thing. 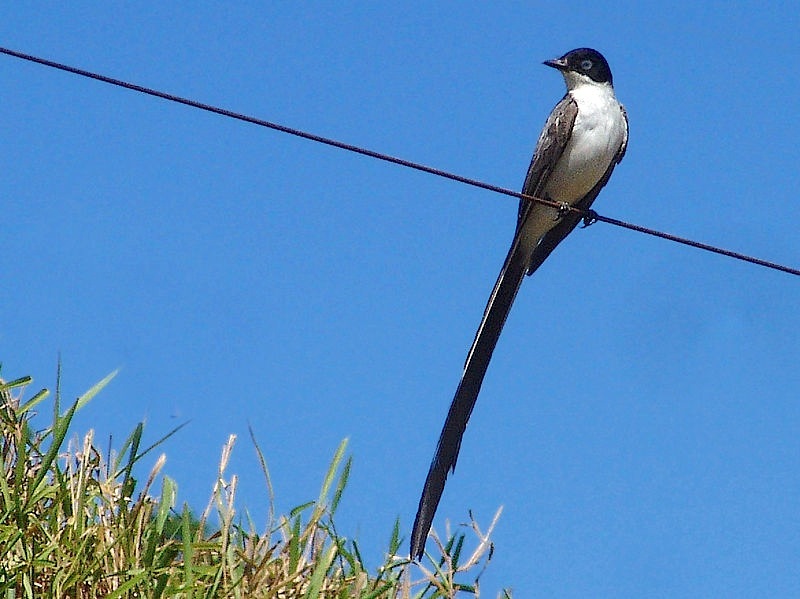 So here is the first-ever Fork-tailed Flycatcher for Abaco – and only the third for the Bahamas (previous ones seen on New Providence and Great Inagua). Treading carefully through a copyright minefield, I have dug out some illustrative images of this flycatcher, shown below. It belongs to the group known as tyrant flycatchers, which includes the kingbirds that are familiar on Abaco. 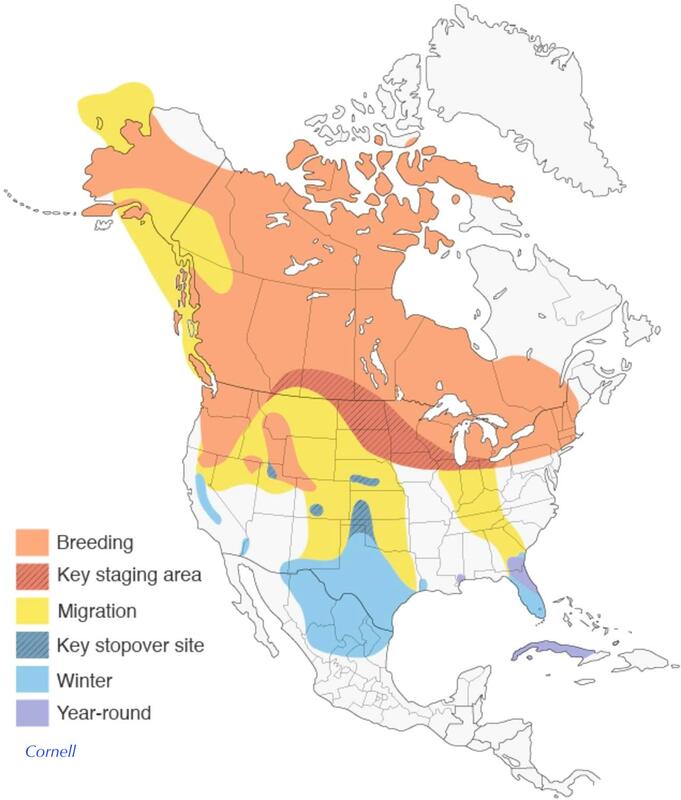 However this ‘overshoot’ range map (Audubon) reflects the fact that overshoots occur almost annually in the eastern United States seaboard and even as far north as Canada. 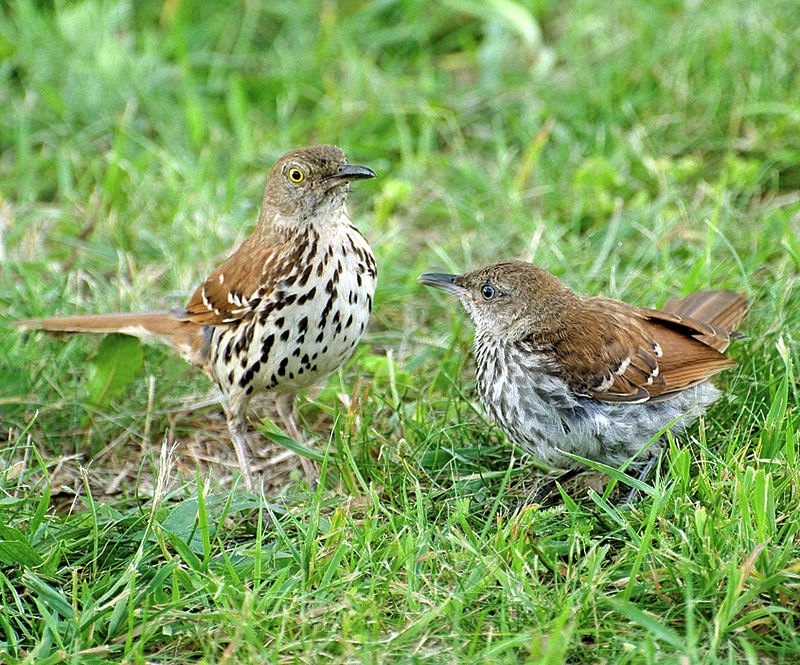 To see these birds photographed in Connecticut (10000birds.com), click HERE. 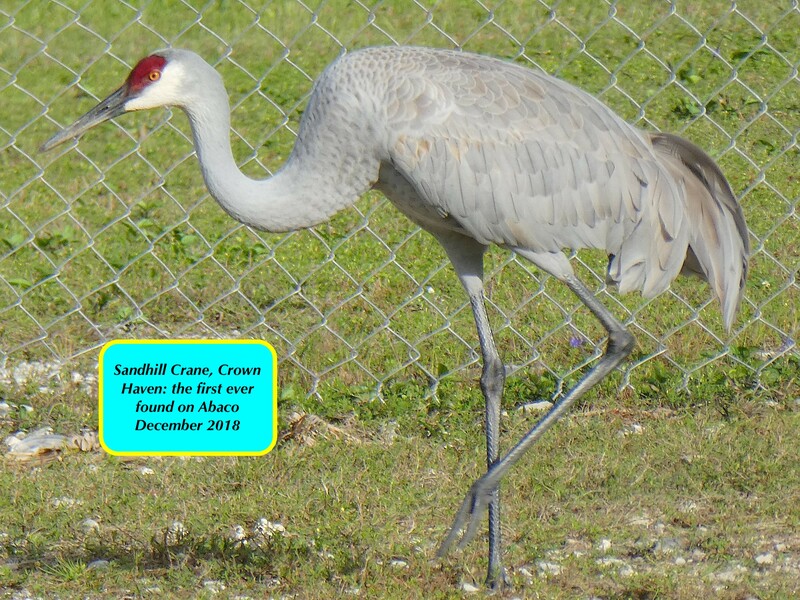 Given that the whole Florida coast is included, it’s perhaps not surprising that sooner or later the odd bird would misdirect to the northern Bahamas. 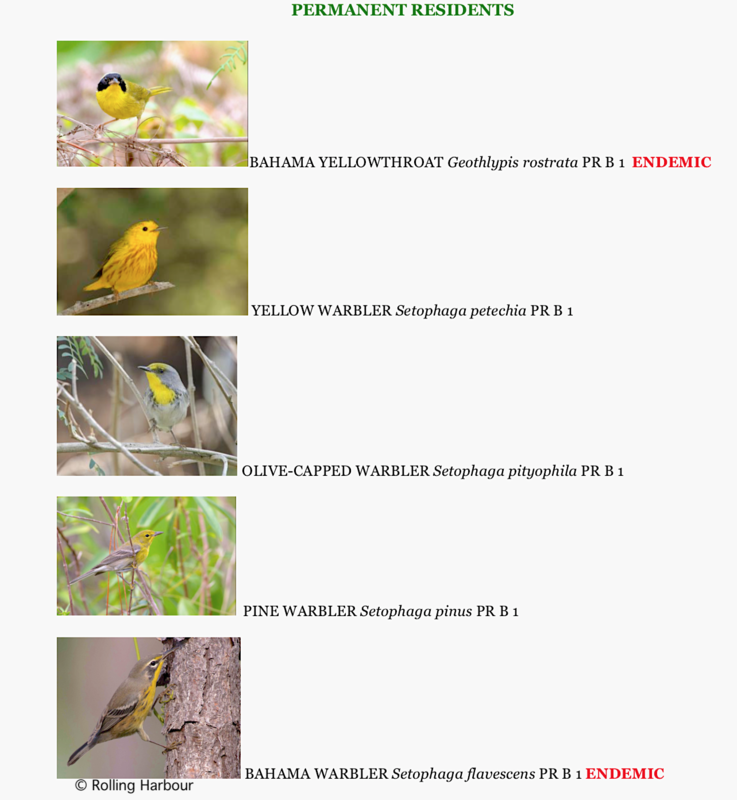 This example of the species is taken from the Crossley ID Guide to Eastern Birds (open source) . 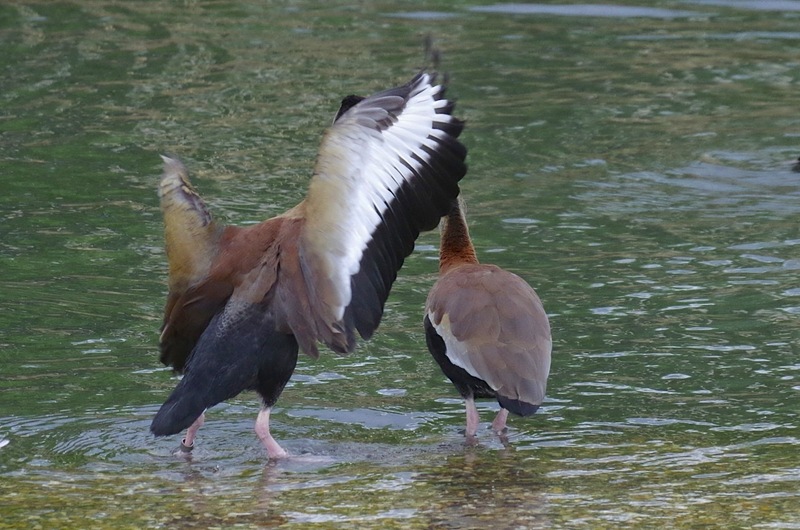 The bird in the centre with the long tail is clearly a male; I imagine the mature-looking one on the left is a female; and the one on the right with the comparatively stumpy tail, a juvenile. 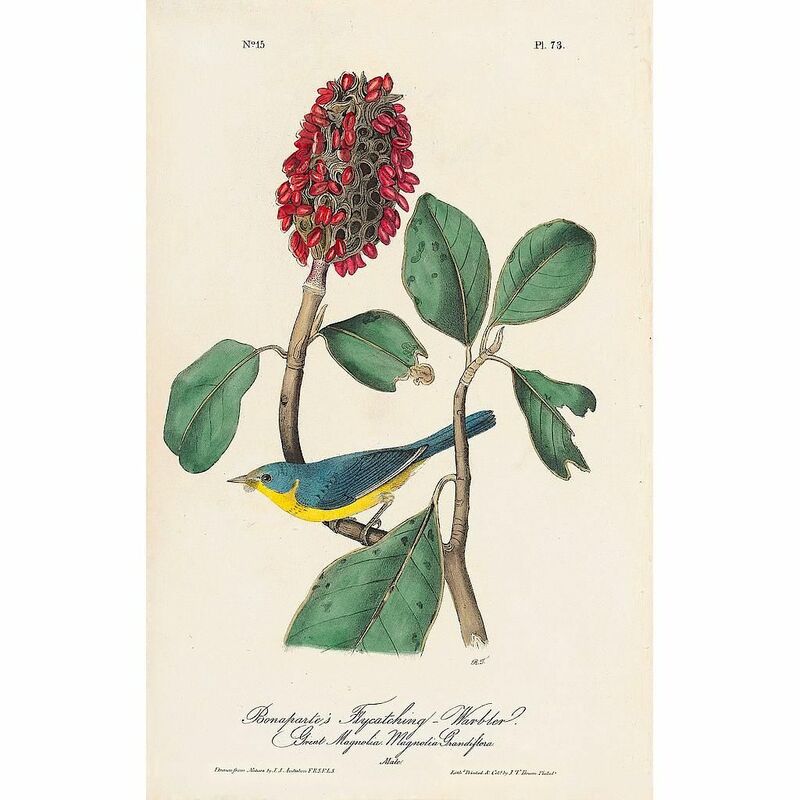 It’s sometimes instructive to discover how John James Audubon saw a particular bird, so here is his FWF. 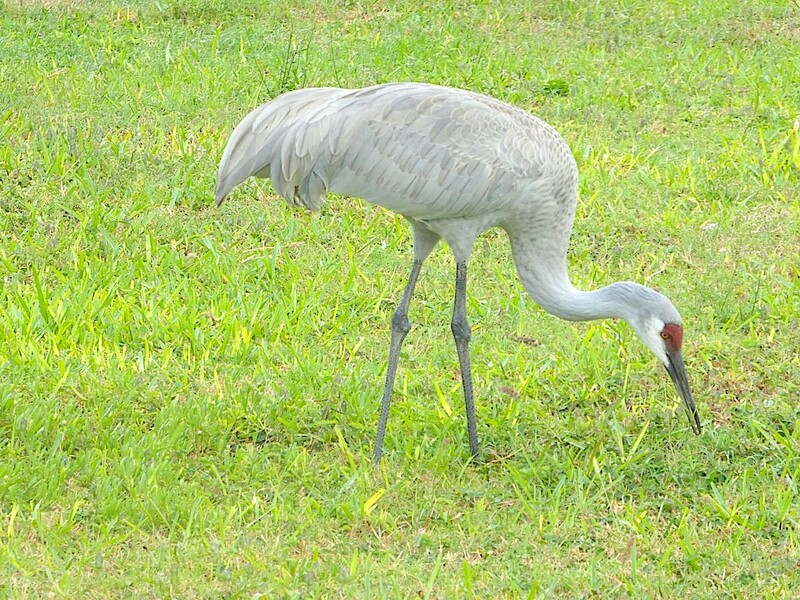 While the bird is undeniably beautiful, I am not too certain of its proportion in relation to the size of the blossom. But then again, it seems to me that he didn’t always struggle for exactitude, preferring a broader, more relaxed approach to depict the birds as he saw them – and not afraid to exaggerate a characteristic for effect. NEW INFO Woody Bracey has contacted me to point out that the male in the image above “is actually a pale mantled manachus subspecies from Central America, not the darker savana nominate subspecies from South America which Shirley photographed”. Which explains the colour difference.